Back in 2001, Angelina Jolie had her then husband, Billy Bob Thornton's, name tattooed on her upper arm. After divorcing following a 2 year marriage, Ms. Jolie set about lazering it off. She's now replaced the tattoo with the geographical coordinates of where all her children were born. Actress Malin Akerman had the initial of her ex-husband Roberto Zincone. They divorced in 2013 after 6 years. She covered the Z with an S to mark her son, Sebastian Zicone's, initials. Elusive Kardashian bro Rob and ex-girlfriend Adrienne Bailon made the brave move to get each others names when they dated in 2007. Former Cheetah Girl Bailon is now engaged to music exec Lenny Santiago and got her tattoo removed on TV show 'Extra' in 2014. Johnny Depp and Winona Ryder were the 90's dream couple, so much so that he got 'Winona Forever' tattooed on his upper arm. After a three year engagement, Johnona broke up and broke our hearts with it. Instead of lazering the tattoo off, Depp altered it to read 'Wino Forever'. Chin chin. Australian rapper Iggy started dating Harlem rapper A$AP Rocky back in 2011 after meeting at their record label. They dated for a year and Iggy (and apparently A$AP) got a tattoo of her boyf's mixtape 'Live Love A$AP'. The 'Fancy' hitmaker is now engaged to LA Lakers star Nick Young and has crossed out the A$AP on her little fingers. Rumours are swirling that she's in the process of getting it lazered off. Katie Price and ex-husband Peter Andre met on 'I'm A Celebrity Get Me Out of Here' and married in a lavish ceremony in 2005. Katie inked Pete's name on her wrist, but they divorced 4 years later with a very public war of words. Katie did an Iggy and forgo-ed lazering to just cross out the name. She has now covered it with a flower. Oh Katie, does she never learn? Ms. Price started dating Argentinian model Leandro Penna in 2011 and swiftly got engaged in April 2012. 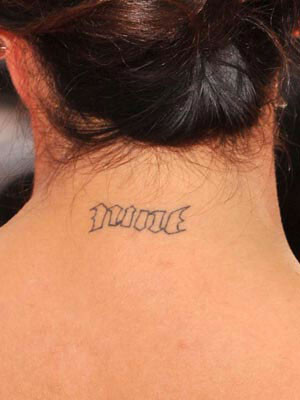 Katie and Leo got matching ankle tattoos to show their love, but broke up in October 2012. It's unknown whether KP has removed the tat. Nick Cannon and Mariah Carey married in 2008 after a whirlwind romance and are parents to twins Monroe and Moroccan. Cannon got 'MARIAH' written across his back shortly after they married, but after announcing their divorce in 2014 the rapper swiftly set to get it covered. Cannon reportedly spent 30 hours getting the elaborate crucifix inking done. Heidi Klum and husband Seal broke the hearts of thousands when their dream marriage of 8 years back in 2012. Since then Klum has set about removing her forearm tattoo of Seal's name, but is keeping the four stars marking her children. Rod Stewarts IT girl daughter Kimberly Stewart got a tattoo on her hip reading 'Daddy's Little Girl Loves Cisco' back in 2005 when she was engaged to musician Cisco Adler. They split later that year and the original KStew changed it to 'Daddy's Little Girl Loves Disco'. Smooth. Melanie Griffiths married Spanish hunk Antonio Banderas way back in 1996, and later that year had a daughter together. They announced their divorce 2014 after 18 years together, and Melanie quickly got down to lazering off her arm ink. The famous 'Antonio' tattoo on her upper arm is thought to be from around 1998, but can now be seen completely lazered off inside the heart. Tattoo artist Kat Von D has had her fair share of relationship ups and downs, a particular bad one being her break up from former Mr. Sandra Bullock, Jesse James in 2010. Ex-LA Ink alum Von D had a tattoo of her motorcyclist bf as a young boy inked on her side, before breaking off their engagement in 2011 amid claims he cheated on her '19 times'. Kat tweeted her excitement at getting the portrait removed in 2012. Puerto Rican crooner Marc Anthony married certified diva Jennifer Lopez back in 2004, who he has twins Max and Emme with. The singer super couple split up in 2012 after 8 years together, and Anthony set about covering his 'Jennifer' wrist tattoo in 2012 with this pocket watch. Our fave Desperate Housewife Eva Longoria married Spurs basketball star Tony Parker in 2007, and got his jersey number NINE tattooed on the nape of her neck. The marriage broke apart 4 years later with Longoria believing Parker had cheated 'multiple times'. In 2012 Eva was seen lazering off the ink. Way back in 2003, Carmen Electra married Jane's Addiction guitarist Dave Navarro on the MTV show 'Til Death Do Us Part: Carmen and Dave'. The couple split up three years later, but both have kept their tattoos dedicated to each other. Electra has the date of their wedding day on her wrist, whilst Navarro has her initials on his chest. Back in 2004 Cheryl Fernandez Versini and Chelsea footballer Ashley Cole were a UK power couple, but split up 6 years later after reports Cole had cheated multiple times. Cheryl is now happily married to French restauranteur Jean-Bernard Fernandez Versini, but still has 'Mrs. C' on her neck. Evan Rachel Wood started dating Billy Elliot star Jamie Bell in 2005 after meeting on the set of a Green Day video. They split up, but married in 2012 after rekindling their romance the year before. They have one son together. The couple announced their split almost 2 years later, but Wood still has the letter 'J' tattooed on her leg for him.